Florida is the birthplace of the fig tree in the United States. Introduced by the Spanish in 1575, it wasn’t until almost 200 years later that it made its appearance in California, where it thrives in the Mediterranean climate. The humidity in Florida makes the fig tree planted there susceptible to diseases while the Florida rain causes the fruit to split. In southern Florida the trees do not receive sufficient winter chilling, so they are better-suited to the middle and northern parts of the state. 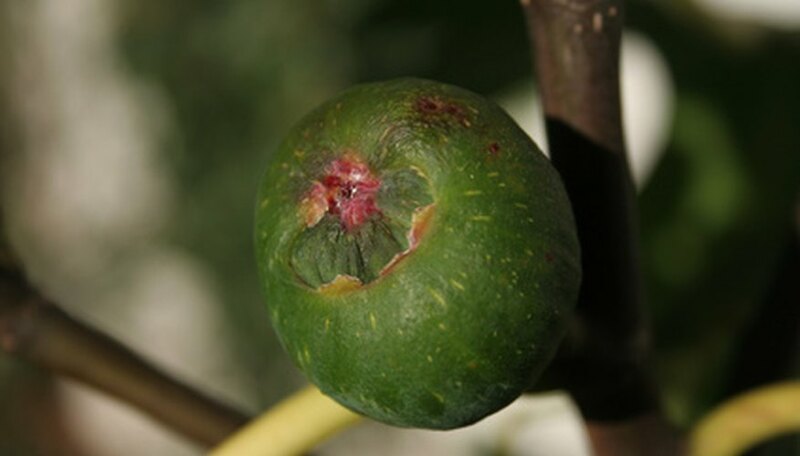 The key to successfully growing figs in Florida is to choose varieties that have been tested by the University of Florida for growth in the state. These include Brown Turkey, Celeste and Alma. Plant the bare root fig tree while it is dormant, in the winter. Container-grown trees can be planted in the landscape at any time. Plant your fig tree in a location that receives sun all day and has lots of room for its massive root systems. The fig tree in Florida will require more air circulation, due to the humidity, than those grown in other parts of the country. Test the soil pH in the planting site. It should be between 6.0 and 6.5. PH can be adjusted by adding soil amendments. Although you can purchase a home-testing kit, the county cooperative extension office offers analysis and you will reap the benefit of their experience in recommending soil amendments appropriate to your region in Florida. These might include aluminum sulfate or calcium carbonate. Remove all weeds within a 3-foot radius of where the tree will be planted. The new tree will not thrive if it is forced to compete for water in the hot Florida sun. Dig the soil to a depth of 1 foot. Use the gardening fork to break up any clumps of soil larger than your fist. Add soil amendments recommended by the pH test results. Add them to the soil, at the rate suggested, and mix them in well to a depth of 8 inches. Dig a hole the twice the depth as the pot in which the plant is growing and three times the width. If you are planting a bare-root fig tree, look for the ring around the lower end of the trunk that will indicate at what depth it was previously planted. Make the hole twice the diameter of the bare root tree’s root ball. Place the roots of the tree into the hole and backfill halfway. Fill the hole with water and allow it to drain, then finish filling the hole with soil. Place a 3-inch layer of mulch 2 inches from the trunk, completely encircling the tree. Mulch will help keep the soil moist and cool in the hot Florida sun. Water the fig tree until the water puddles and keep the soil moist until the tree is established and growing. Then, cut back to a weekly deep watering. In your area of Florida, if the weather is particularly dry, water twice weekly.